Study homeopathy from anywhere with our numerous online courses tailored for all levels. If you are unable to access the CHE College, our online courses allow you to study homeopathy without the need for you to travel to the lectures. You’ll get access to all the course videos and resources Allowing you to study wherever, whenever you want, from your phone, tablet or computer. You’ll have access to group mentoring calls (foundation course) Ensuring you get the support you need to enjoy the full benefit of the course in between weekends. You’ll be part of the CHE student community You’ll have exclusive, private access to the CHE Members-Only Facebook group, the hub for a vibrant community of students and practitioners who are passionate about homeopathy. If you want to gain skills in and knowledge of homeopathy but can’t attend classes at our campus in London, our online foundation course is perfect for you. The course emphasizes a combination of inspirational learning and participation in a friendly community of like-minded fellow students, without the worry of any upcoming assessments, all from the comfort of your own home. If you want to become a homeopathic practitioner but are unable to travel to the UK then our online Practitioner Licentiate course will enable you to graduate as a homeopathy from the comfort of your own home. The course covers all the modules of our Liceniate classroom based programmes here in London. All clinical hours are completed through our online clinic. 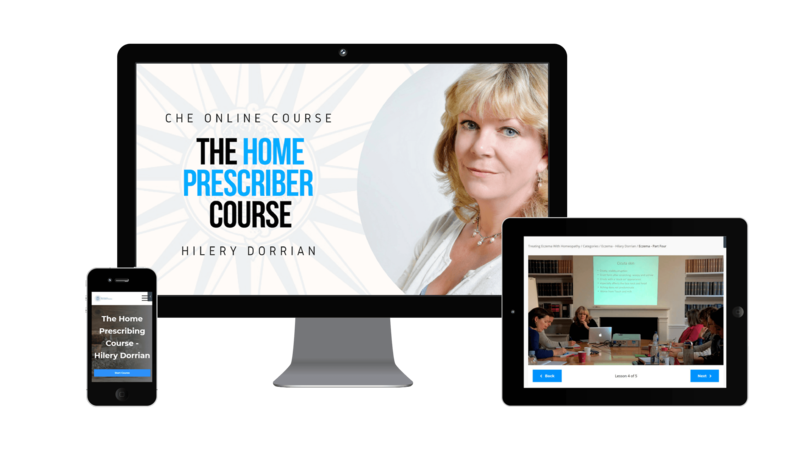 The Home Prescriber Course is perfect for beginners as it gives you the knowledge and confidence to treat yourself, family and friends safely and effectively with homeopathy. You’ll get to explore the history and principles of a health system utilised by millions of people worldwide. You’ll also learn about the most common illnesses and the many helpful remedies to have on hand for first aid situations, headaches, coughs, colds, bites, burns and many other common ailments and injuries.